The crescent-shaped banana reigns as one of the world’s most favourite fruits. Neatly tucked in its own peel, the grab and go benefit makes it a portable choice and eco-friendly when it comes to disposing the skin. Just peel and take a bite – no utensils required. Loaded with valuable micronutrients especially potassium, this tropical fruit is an excellent source of vitamin C, D, B6, fibre, and carbodydrates. Bananas can be eaten alone or mixed into a fruit salad, added to the gelatin dessert of jello, or spun into a smoothie, a milkshake or baked into a delicious banana bread. The ancestors of the domestic banana plant and also a wild variety of remain inedible due to several large black seeds are called Butuhan in the Philippines and Kluay Tani in Thailand. The bananas we see today are the tasty mutants with immature seeds that won’t develop at all. Originally found in Southeast Asia, bananas were brought west by Arab conquerors, then moved from Asia Minor to Africa. From Africa to the Americas, Spanish and Portuguese colonists adopted the fruit’s African name “banana,” which might have been derived from the Arabic word meaning ‘finger’. 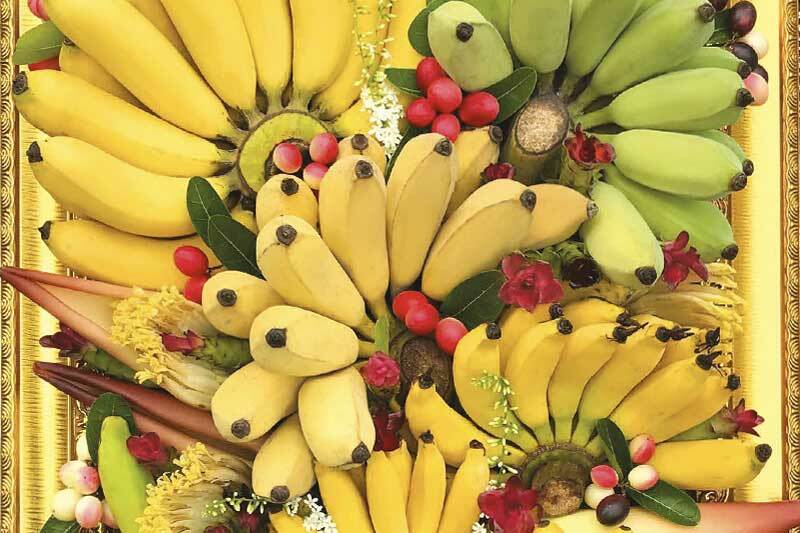 There are more than 1,000 varieties of bananas in Africa and Asia. They are the world’s most popular fruit which have been eaten everywhere from New York to Berlin, London to Moscow. Thailand has plenty of banana varieties too, Kluay Nam Wa or Pisang Awak (sweet, firm and with a bit of sticky, starchy texture when eaten), Kluay Leb Mue Nang or Lady’s Finger Banana (creamy consistency with a sweet flavour), Kluay Khai or Baby Banana (rich and sweet, with a honey-like taste), Kluay Hak Mook or Silver Bluggoe (sweet, with a fluffy texture). Bananas in Thailand can be eaten raw or cooked as snacks or savoury dishes: Kaeng Luk Kluay (a young banana curry), Khao Tom Mut (banana in steamed sticky rice), Kluay Buat Chi (bananas in coconut milk), Kluay Ping (grilled banana) and Kluay Tak (sun-dried banana). Endless in taste and varieties, the tropical prosperity of bananas indeed knows no bounds.